How you can become an impactful and effective presenter? This is something I support my clients to become, supplementing their skills and boosting their confidence when it comes to meetings, pitches, negotiations, speaking and presentations. I’m also the trainer for the IDM and The Association of Association Executives on this subject. 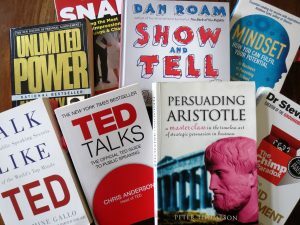 Here is my list of recommended reading on the subject. I’d be interested to hear yours. Do get in touch. Watch TED Talks: great resource of talented speakers to watch and learn from online. Attend events: Find events where the speakers interest you. Go along and study their style. What do you think? What has inspired you? What books would you add to this list? Let me know, I’d be pleased to hear from you. Or take a look at my other writing on the subject, here.